I’m Pete, and I’m a kiwi. As one of New Zealand's national symbols and favourite birds, you could say I make a great local guide for getting a bird's eye view on our superb country. Well, I've put together a 8 day New Zealand itinerary to inspire you to get your beak into all sorts of unique Kiwi experiences. Get off the beaten track, explore like a local, get up close with some of my feathered (or scaly) friends, and discover New Zealand's commitment to conservation. Start with a fossick around Auckland, New Zealand's largest city. 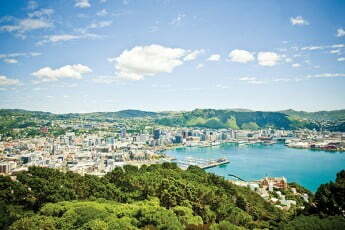 Set between two harbours, Auckland has an amazing range of things to see and do. It's a place where vibrant city style and spectacular landscapes go hand in hand. So, get ready as the adventure is about to begin. A trip to Auckland wouldn’t be complete without a visit to the iconic Sky Tower. View the city from 220 metres above street level, and experience panoramic 360˚ views in each direction. If dining with a view is what you're after, then you're spoilt for choice, with two restaurants and a cafe located inside the Sky Tower itself. Have a gander at Auckland's magnificent Hauraki Gulf. The jewel of the gulf is Waiheke Island, a haven of vineyards, golden sand beaches and fine dining. Can't swim or fly? There's a ferry that'll take you there from Auckland in just half an hour. Or, visit Rangitoto Island and climb to the summit for an incredible 360-degree view of the Hauraki Gulf and city - the photos won't do it justice. You might even see dolphins and local marine wildlife along the way. If you're feeling adventurous, take a day trip to Rotoroa Island, an arts, heritage and conservation park. History buff? Uncover the world-class exhibitions in the beautiful Auckland Museum. It has the world's largest collection of Māori taonga, representations of all the major tribes of Aotearoa - that's the Māori name for New Zealand! Drive from Auckland to Matamata. There's something truly special tucked away on the picturesque private farmland near the small town of Matamata - the Hobbiton Movie Set! Hobbiton is a must see if you're a Lord of the Rings and Hobbit fan. Take a guided tour and enjoy the town''s magical cafes. The guided tour has more than 44 unique hobbit holes, including Bag End (Bilbo's house). As you wander through the heart of the Shire, you'll get to hear fascinating commentary about how it was all created for the movies. Along your journey you'll see the mill, the double arched bridge and the famous Party Tree before stopping for a drink at the Green Dragon Inn. Evening tours are also available, and they include a feast fit for a hungry hobbit! Drive from Matamata to Rotorua. Welcome to Rotorua, New Zealand's coolest hot spot. Rotorua is one of New Zealand's true getaway destinations and a geothermal wonderland. Home to our globally unique Māori culture, this is the place where the traditional and contemporary parts of our culture are celebrated for all to share. Rotorua has an exciting fusion of contemporary Māori culture and outdoor adventure. Get right into Māori culture, starting at Te Puia. It's a geothermal wonderland with the largest active geyser in the whole southern hemisphere. And watch out! It erupts once or twice every hour, sometimes reaching heights of 100 feet. Then head to an evening cultural show in the heartland of Māori culture. Manaakitanga (hospitality) is something the Te Arawa Māori have been showing visitors for more than 150 years. Check out Rotorua's native and exotic forests at your own pace. You'll find a network of trails, tree platforms and swing bridges to explore. Or, my favourite - fly through the trees on a zipline for a more surprising point of view. You can hire a mountain bike and trek through the Whakarewarewa Redwood forest. The 130km trail network has something for every skill level. Even mine! Overlooking native forest and Lake Rotorua, you can relax at Polynesian Spa in one of 26 mineral hot pools. If you'd like to experience New Zealand's only mud baths, head to Hells Gate and pamper yourself with a traditional Māori Miri Miri massage and mud therapies. Fly from Rotorua to Wellington. Welcome to Wellington, the world's coolest little capital. It radiates energy, culture and character, and it's known for a vibrant arts scene, world class cafés, restaurants and an active outdoor lifestyle. I think you'll be impressed. Wellington is a creative, cosmopolitan city, combining the sophistication of a capital with the warmth and personality of a village. Say kia ora to the critters and creatures at Zealandia, the world's first fully-fenced urban eco-sanctuary. Meet some of New Zealand's rarest birds, reptiles and insects. Visit the Weta Cave, a mini museum with movie props and collectables from Weta Workshop on display. Surround yourself with 20 years of creativity at Weta Studios. Get up close to the authentic props, costumes and concept designs created for The Lord of the Rings and The Hobbit trilogies, as well as Avatar, District 9, and more. Discover the treasures and stories of New Zealand at Te Papa, the country's extraordinary and interactive national museum. You can walk right into a whale heart there - I'm not kidding about that! Fly from Wellington to Christchurch. Let's fly south! Christchurch is a short flight away on the South Island, and you'll find it's a hub of urban creativity. Christchurch has a unique heritage, picturesque gardens, and unexpected adventure. Set against a majestic ocean-to-alps backdrop, the city's glorious gardens and parks, vibrant street art and serene river scenery set it apart. Head to the International Antarctic Centre. You'll journey through modern day Antarctica and experience a taste of this unique continent. Take a ride on all-terrain, amphibious Hagglund, experience a magical simulated 4D Antarctic cruise and hang out with little blue penguins. Some of them are my mates! Visit the Christchurch Arts Centre, one of the biggest and best collections of Gothic Revival architecture in New Zealand. Immerse yourself in arts, crafts and delicious food - ah, food! - as you discover something different around every corner. Like being on the water? You'll want to see New Zealand's marine wildlife all up close and personal. Take a day trip to Kaikoura, just a 3 hour drive from Christchurch. That's where whales, dolphins, fur seals, albatrosses and other birdlife hang out, along with spectacular new seabed and geological formations. Alternatively, drive to Akaroa (1 hour 30 minutes drive from Christchurch) and take a cruise on stunning Akaroa Harbour to swim with the dolphins or to watch the Hector's dolphins, the world's smallest dolphins, at play. Drive from Christchurch to Tekapo. I bet you've never seen turquoise water like this before! Lake Tekapo is a magnificent spectacle year-round. There are so many ways to enjoy this part of the country - like hiking, fishing or relaxing in hot pools while gazing at the lake. After a busy day of sightseeing there's no better place to have a soak than at Tekapo Springs Hot Pools. Overlooking the beauty of Lake Tekapo and the mountains beyond, the hot pools get their water from alpine springs and it's heated to 28-40 degrees Celsius. It has New Zealand's largest inflatable waterslide, sauna and steam rooms, fully equipped day spa and an aqua play area for kids, so there's something here for everyone in your flock. 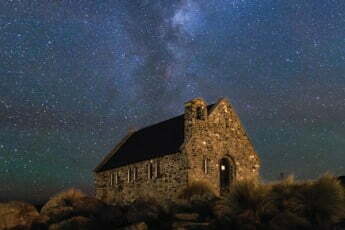 The Aoraki/Mackenzie International Dark Sky Reserve is the largest reserve of its kind in the world. With more than 4,300 square kilometres free of light pollution, it's the perfect place to go stargazing. Don't have great night vision like me? Head to Earth & Sky in Tekapo or Big Sky Stargazing at Aoraki Mt Cook Village for the chance to gaze into space through powerful telescopes. Enjoy a family picnic out on the lake. If you're here in season you’ll be surrounded by beautiful lupins as far as you can see. Drive from Tekapo to Queenstown. Surrounded by majestic mountains and nestled on the shores of Lake Wakatipu, Queenstown is known for its stunning scenery, adventure, and cosmopolitan vibe. Its mountains, lakes, rivers and valleys are just waiting for your footprints. So, get outside and enjoy the natural beauty with a nature experience you'll have nowhere else. Take a tour of the New Zealand conservation areas that were the backdrop for Peter Jackson's Lord of the Rings trilogy. Search for hobbits! Visit Kiwi Birdlife Park, 5 acres of forest sanctuary tucked away right in the heart of Queenstown. They coordinate conservation projects throughout New Zealand. At the Kiwi Birdlife Park, there are so many ways you can experience the special world of birds and ancient reptiles. I still like to go myself to learn something new! The Queenstown Trail network has 120km of easy to intermediate trails following pristine rivers, lakes and mountain ranges as well and it passes by iconic Queenstown experiences like bungy jumping, jet boating and wine tasting. Perhaps you'll get some inspiration for your next adventure along the way. Drive from Queenstown to Dunedin. Oh boy, you're going to love Dunedin. It's one of the world's great small cities, with unspoiled architecture and loads of Scottish influence, charm and character. It's also proud to be New Zealand's hub for learning, heritage, arts and culture. Close to the city is Otago Peninsula, where you can see rare and wonderful wildlife species' in their natural habitat. This is NZ's wildlife capital! Some of the world's most unique and rare marine and terrestrial species can be easily found in our stunning coastal landscapes and hinterlands. Venture along the Otago Peninsula for encounters with little blue penguins, yellow-eyed penguins, albatross, fur seals and sea lions. Otago Peninsula also has a blue penguin colony on Pukekura Beach at Taiaroa Head. And every evening at dusk these enchanting little birds waddle up the beach to their homes after a day at sea. 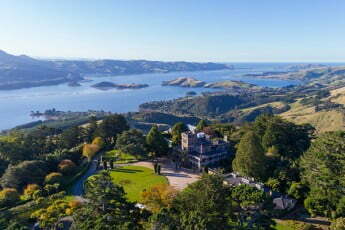 Visit Larnach Castle, built in 1871 by Scottish merchant William Larnach. The castle and its splendid gardens have been carefully restored. You'll learn about Victorian culture and the castle's scandalous and tragic history. 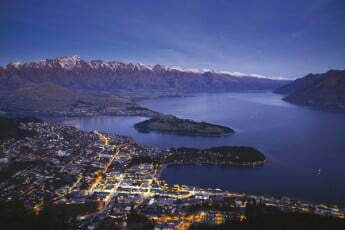 Find out more about Dunedin. Fly from Dunedin to Auckland. Well, that's it, my friends. It's time for you to head back to Auckland. It's been a pleasure sharing New Zealand's highlights with you. If you ever need a guide while you're here, just ask for Pete.